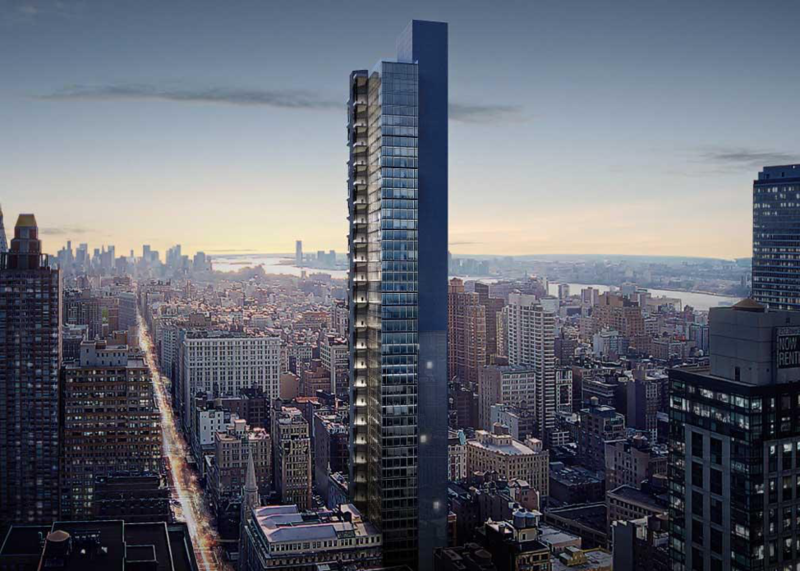 In yet another sign of the NoMad neighborhood’s rapid redevelopment, Yimby reports that construction appears to have started at 29th Street and Fifth Avenue, where developer HFZ Capital Group is planning a 551-foot-tall skyscraper designed by Bjarke Ingels Group (BIG). Excavation and foundation work are expected to commence this year, with an estimated completion date for the building sometime in 2021 or 2022. According to renderings, the new office tower (with a formal address of 3 West 29th Street, the former site of the Bancroft Building) will encompass 300,000 square feet and be 34-stories tall. Renderings also depict a glass curtain wall on the building’s eastern side, punctuated by open terraces where workers can enjoy the view. Some concerns have arisen over the impact of such large projects on the scale of the neighborhood and neighboring buildings. In this case, the new skyscraper will rise between two landmarked structures—Gilsey House and the Marble Collegiate Church. It is heartening to know that the developers will be significantly refurbishing both Marble Collegiate Church and Gilsey House as part of the project, giving new life and restored glory to both historic structures, while sensitively setting the new structure back from the street line. Progress and continuity can live side-by-side. While improving property values, adding jobs, and generating millions of dollars for NoMad-based businesses, this new building from highly regarded BIG architects also promises to put another landmark building in NoMad for future generations to enjoy, all the while preserving the heritage of this legendary neighborhood.